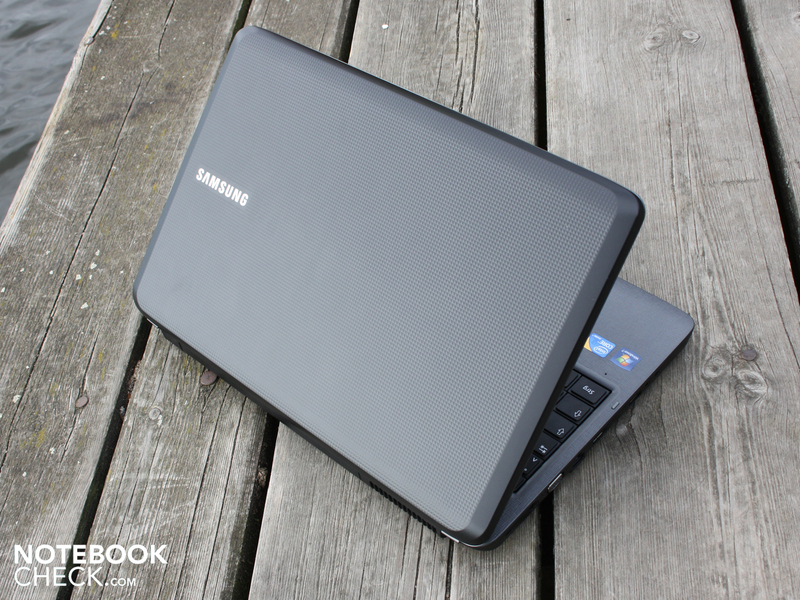 Samsung's P series represent the manufacturer's range of business laptops. The 15.6 (P530, P580) and 14 inchers (P480) come in configurations starting with a Core i3-330M processor without dedicated graphics. The most expensive variation has a GeForce GT 330M and a Core i5-520M (only P580 Pro Pikaso, P480 Pro). For our test, we picked up the lowest priced P model costing 729 Euro (market price of 620 Euro). 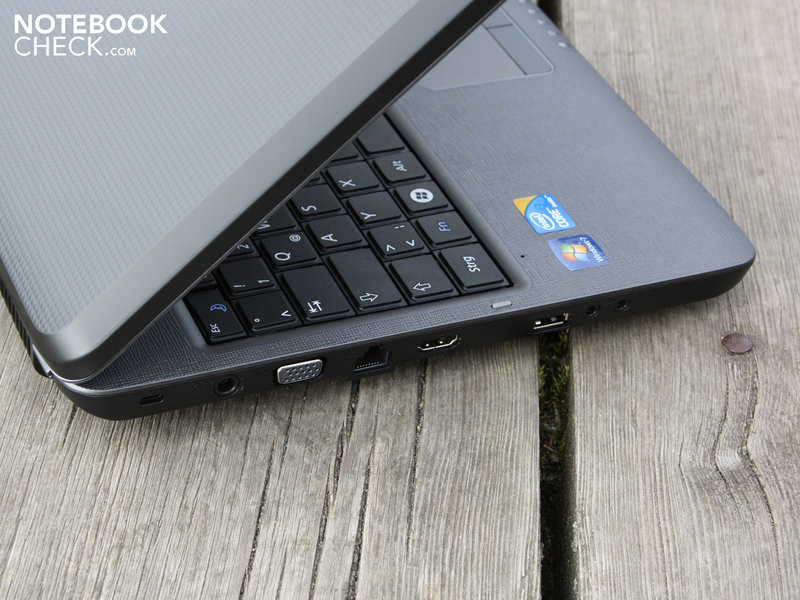 The P530 Pro Pitts works with the smallest Arrandale processor from Intel, the Core i3-330M (2.13 GHz). It is a 15.6 incher which focuses on the basics since at this price it has few connections, no Bluetooth, no internal UMTS module and also no graphic card. On the Consumer notebooks (up to 600 Euro), we already find entry-level graphic cards a la ATI HD5470 (ex. Acer Aspire 5741G) for the price. 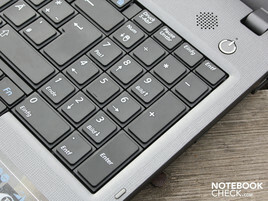 Whether the P530 Pro can prove itself a capable office notebook even without a graphic card, and whether or not it is worth the money will be shown in this review. The P530 Pro's aspirations as an office machine can be seen from far away. The surfaces are entirely unpainted, matt, and to a large extent fashioned with a haptic surface. The gray visuals don't try to cause a stir with effects or a high-gloss finish. But there are still some details which make the case optically pleasing. The finish of the lid is made up of small, equally-sized quadrants. Visually, this gives a nice effect as the quartering of every one of these small quadrants creates a consistent shadow. But the best part of this surface is the lovely hard-wearing look and feel. This continues over onto the framing of the matt LCD. The surface of the working area has been roughened to a nice, unevenly cross-hatched texture. It is patterned on leather and is, as is typical of plastic, not particularly upscale. The palm rest can be lightly dented around the touchpad. 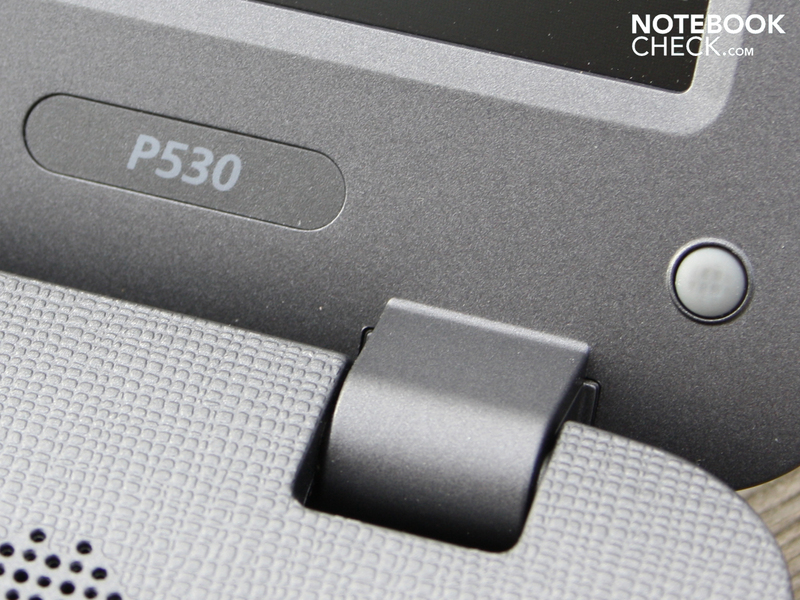 With its matt and grained surfaces, the P530 Pro sits well gripped by ones hands. But the character of the simple plastic construction is unmistakable when holding the machine. Fingerprints aren't left behind anywhere. Because the surfaces aren't painted, unattractive scratches shouldn't be a problem. The base unit is quite stable and we couldn't bend or distort it even with both hands. 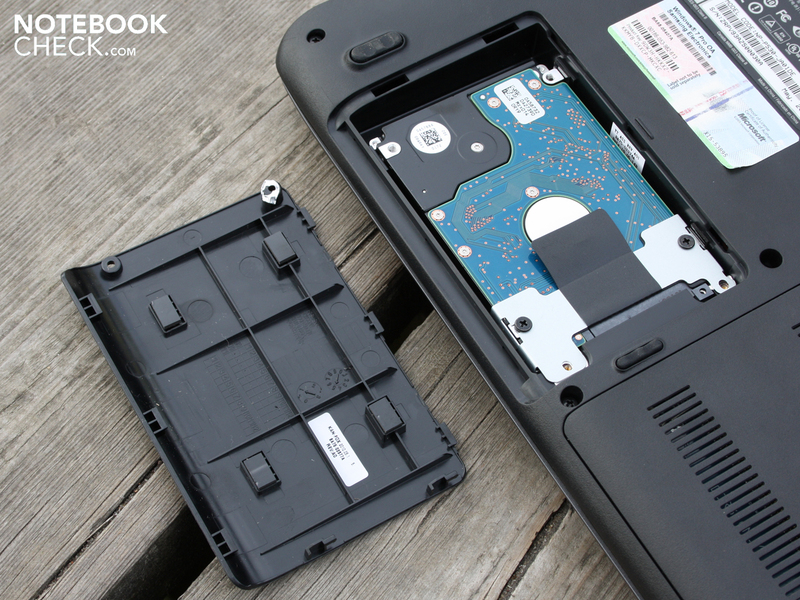 The base plate is less perfect: Ventilation openings and the HDD port buckle noticeably to pushing. There is no big critique of its stability as it is reasonable, though not perfect. The manufacturer bit off a bit more than it could chew with its "Samsung Duracase": "The special architecture of the case on the P530 insures outstanding stability and durability." We could lightly dent the surface of the lid. In contrast, the torsional rigidity is good. The display's hinges sit securely on the frame and hold the lid securely upright and without any teetering. 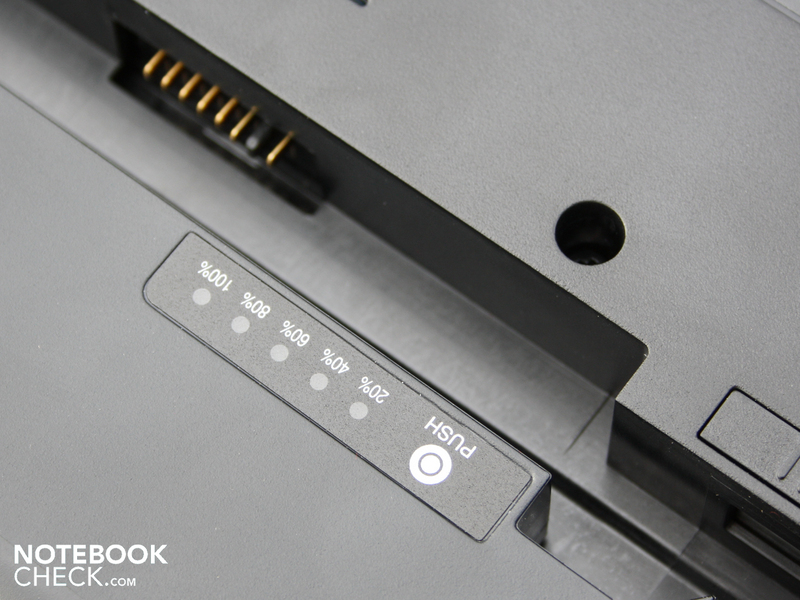 The P530 Pro does not have a hook or a magnet to fix the lid to the base unit. The lid rests on its own weight and prevents the lid from opening on its own through the resistance of the hinges alone. However, the lid does open about three centimeters on its own when turned upside down. In terms of connectivity, there is very little to mention. The connections are almost all bundled on the left side of the case. The backside remains completely empty, which could have proved somewhat advantageous for hooking it up as a stationary device on a desk. Next to the power outlet, we find on the left a VGA (D-Sub), a USB port, an Ethernet connection, two Audio plug-ins and a HDMI port. The card reader is found totally inconspicuously on the front. The plug-ins are well placed. Both of the right USB 2.0 ports are housed at the far back. The USB cable for a printer, mouse, etc can also also be lead out back. Those who plug in a mouse here don't have to wrestle with device cables. Also on the left, the few cables a la VGA, power and Ethernet are found here toward the back. We would like to mention a further plus, namely the software equipment including two recovery medium. Samsung put Windows 7 Professional 32 bit and XP professional 32 bit in the box. 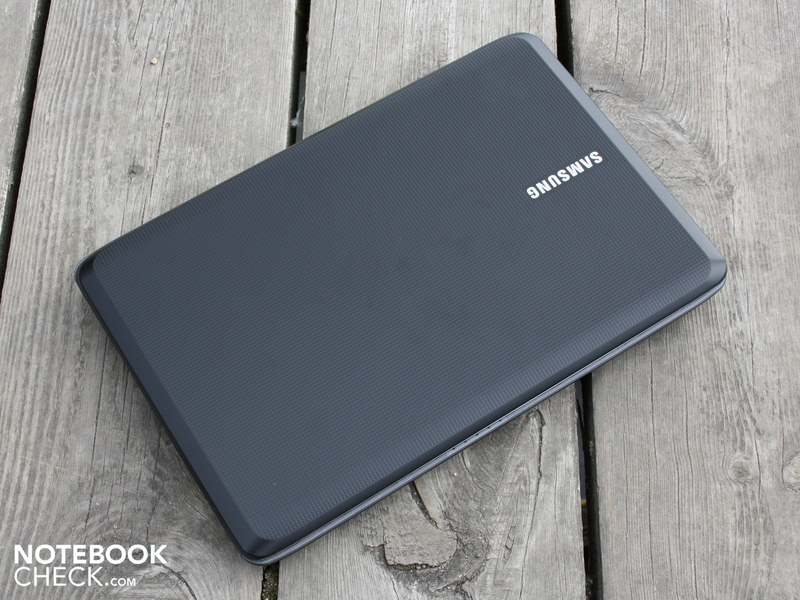 In addition to that, there is the easy-to-use and thus first-rate Samsung Recovery Solution. With this, even very inexperienced users can easily create recovery or security medium (image of a particular time period). One small flaw: The 32 bit OS hinders the processor a bit. 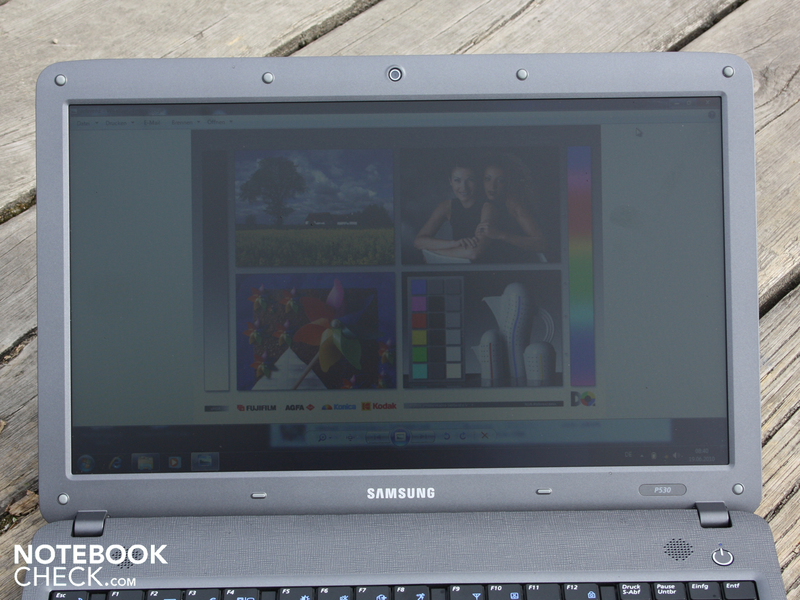 A radio module from Atheros (AR9285) is at work in the Samsung P530. This supports the fastest transfer standard Draft-N (300 Mbit in theory). The tethered network card offers no Gigabyte-Ethernet (Marvell Yukon 88E8040 PCI-E). Bluetooth is not on board. 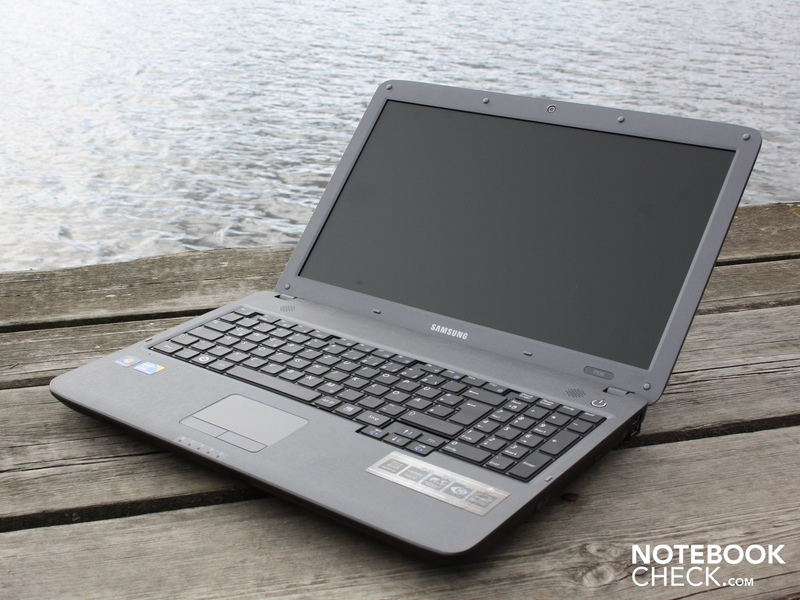 Samsung equipped the P530 Pro Pitts with a keyboard with great feedback. The keys sit close to one another, though all on a small landing. This makes the visual space quite large. The certainty with which fingers hit the right keys when writing is very good, although the touch typing markings on F and J are hardly perceptible. The keys have a clear pressure point and a long stroke. The keys hit solidly, apart from the area around the numeric keypad. 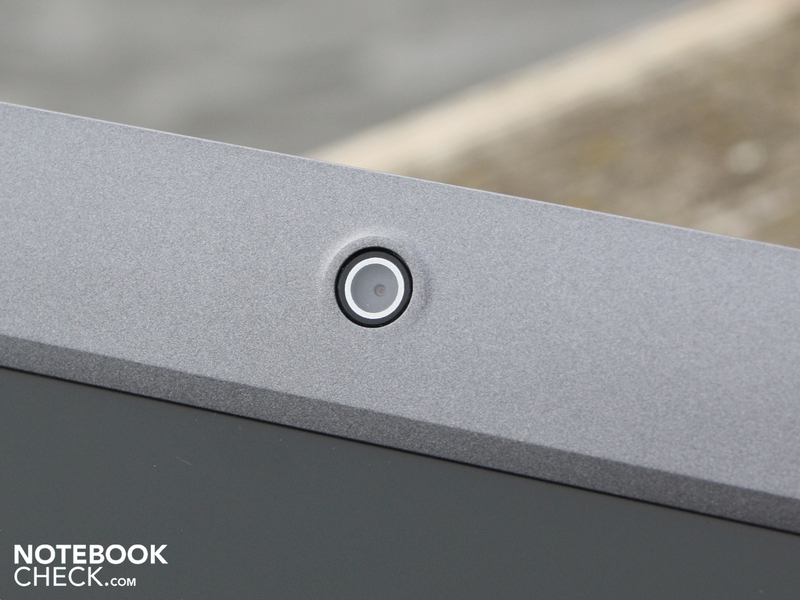 Here, above the optical driver, the surface of the keyboard buckles a bit, which results in some suspension when typing. Writing on the keyboard is fun, for which some credit goes to the non-slip and wide palm rest. Large hands find plenty of space here. When putting in numeric keypad pays dividends. We think very highly of the spatially detached directional keys below the large Shift and Enter keys. The project a centimeter into the palm rests. There is still enough room here for a second Fn key. With it, volume and brightness can be adjusted with a single hand. 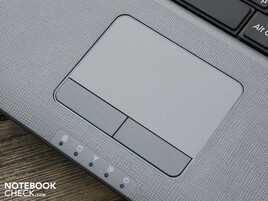 The touchpad is integrated almost flush with the palm rest and is only separated with a thin edging. We can tell the difference slightly thanks to the muster of the palm rests. The pad lights up blue during activity (border). Despite the limited size, it works quite well as the matt surface offers enough friction and is thus not too smooth. It is a multitouch-pad which recognized for instance two-finger rolling or zooming movements. Those who don't want to work with that can use rather the vertical and horizontal scrollbar. These are not marked visually or by feel. The keys of the pad have a medium pressure point. Unfortunately, we perceived the clicking sound to be too loud. The user's neighbor in the library will not be grateful for the annoying clatter. Samsung puts a HD Ready Panel of its own make (LTN154X3-L01) to service in the 15.6 incher. 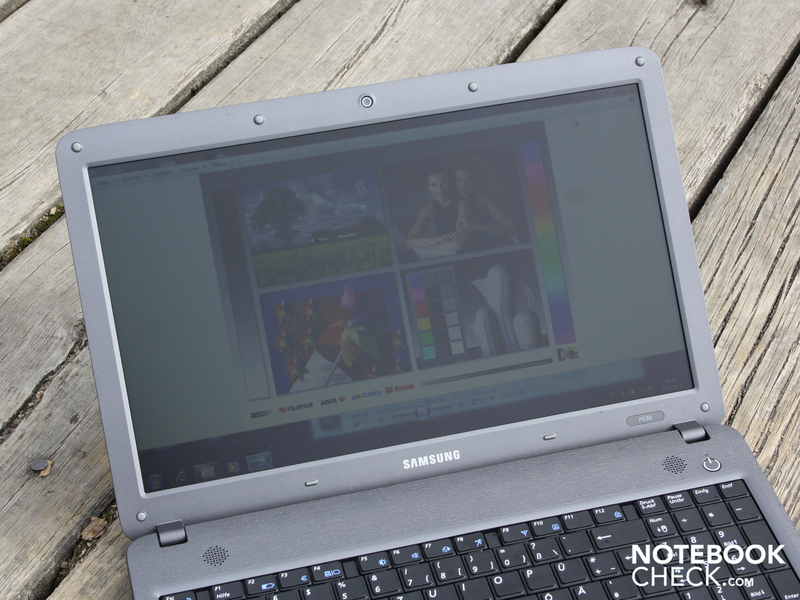 It is the same Panel type as on the R525 Eikee (Consumer Multimedia) whereby it comes in glare version there. The Samsung panel has a native resolution of 1.366 x 768 pixels. The 16:9 display has an anti-glare finish and is thereby almost free of reflections. The 134:1 contrast of the display is exceptionally low but unfortunately typical for office laptops. Because of this, colors seem flatter and lifeless rather than sharp and fresh. The LED backlighting distributes the brightness (average of 210 cd/m²) reasonably well across the panel (84 percent). At the middle and below we measured a maximum value of 230 cd/m². That is more than enough for working in the office. A panel is typically run with 100 to 160 cd/m² indoors. Above, both on the left and right, the brightness falls to just under 200 cd/m². The differences are not perceptible to the eye. The brightness is slightly above-average for the notebook class. The good luminance (210 cd/m²) assures agreeable viewing conditions under daylight. Thanks to the anti-glare finish, reflections on the panel are as good as non-existent. The photos on the side were taken under light cloud cover. Nevertheless, the brightness is not so strong that we could use the panel under direct sunlight without any problems. Cloud cover or a shady place are definitely recommendable. Viewing angles describe whether colors or writing is clearly recognizable when looked at from the side or whether the picture darkens and/or the colors invert. 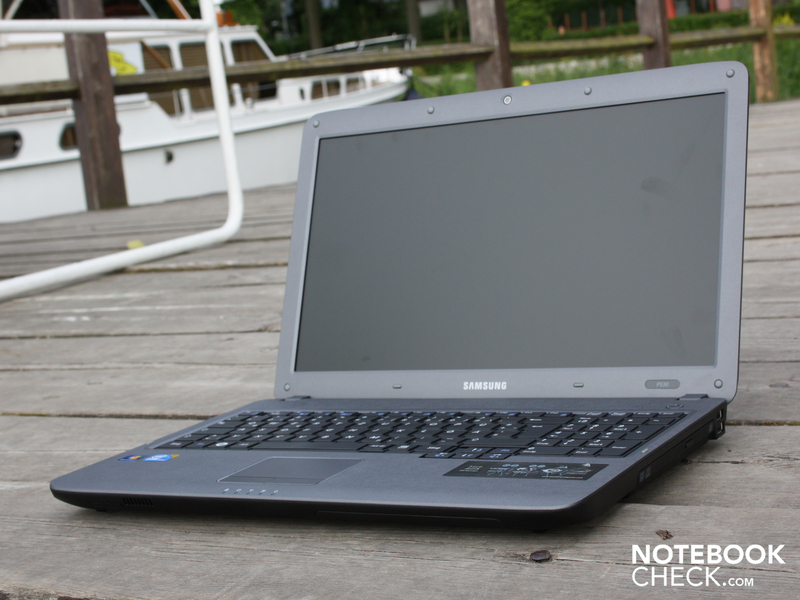 We don't have much room to work with on Samsung's 15.6" P530 Pro. If one's eye diverge upwards or downwards (vertical), colors start to clearly invert already at 20 degrees. From right to left (horizontal), one's eyes can divert up to 45 degrees from the middle though they can't also drift upwards or downwards (vertically). 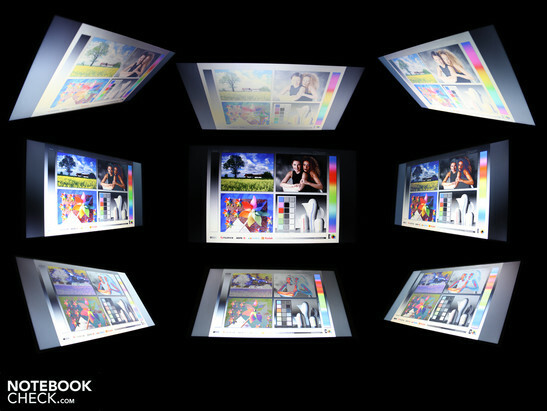 Only with an angle larger than 45 degrees do the colors invert and the display darkens. The Core i3-330M (2.13 GHz, 3 MB L2 Cache) is the smallest Arrandale processor from Intel. Like the i5 series, the 330M has an integrated graphic unit in the processor which acts as the sole GPU pottering around in the P530. What the i3 does not have in comparison to the i5 or i7 is Turbo Boost. This function allows the CPU cores to dynamically overclock. With it, single-core applications also get the best performance, just like on multi-core applications. For performance-oriented users or gamers, Turbo Boost offers a big advantage as all types of applications are sped up. But the P530 Pro has none of that. An important characteristic of the i3-330M is Hyper-Threading (HT). For each physical core, HT provides an additional, virtual core. 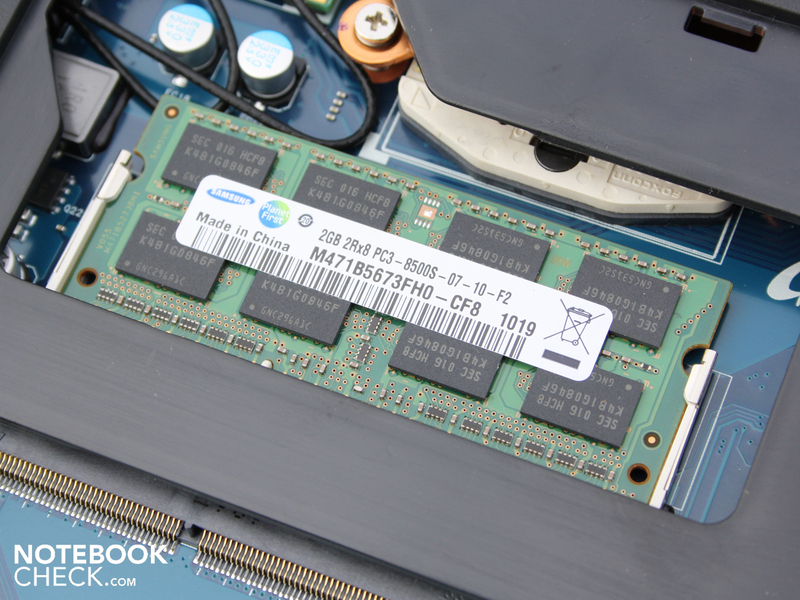 The dual-core can thereby process a total of 4 threads. 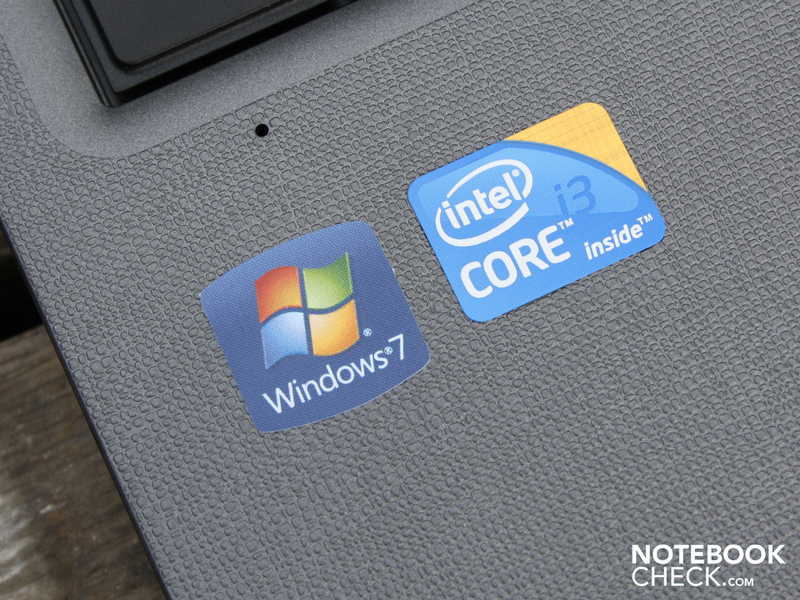 The Core 2 Duo predecessor didn't have HT, but rather the Intel Atom in the first and second generations. The Core i3 has at its side a mere 2.048 MB DDR3 SDRAM (1 module, 1 outlet open). 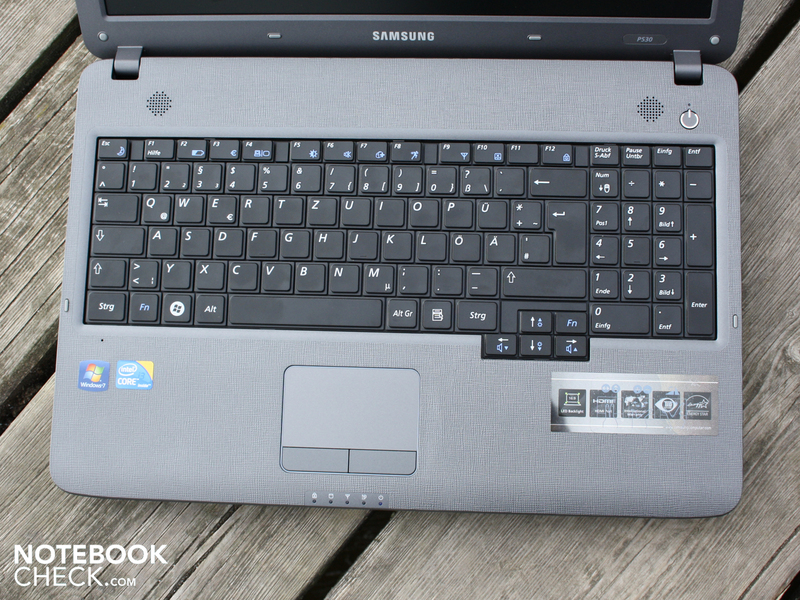 Though this frugality from Samsung doesn't make much sense in today's world of notebooks carrying four GB as standard, it does at least work with the 32 bit OS. The IGP graphics Intel Graphics Media Accelerator HD (GMA HD) is faster than the old GMA 4500MHD. We measured 1.311 points (1.280x1.024) in the 3DMark2006. That is in line with the low level of a GeForce 9400 alias ION. The power is definitely not enough to run the latest games, which of course is not the point of an energy-saving IGP graphic card. Their goal is hardware acceleration (whilst discharging the CPU) during HD video decoding (MPEG2, H264, WMV9, VC1). At 35 watts with a TDP, the current consumption of the i3-330M is as high as on the T models of the Core 2 Deo series. But that also includes the graphic card and the memory controller. Considering that, the overall energy demands are less than with the previous generation Core 2 Duo. The PCMark Vantage calculated 4.000 points. The value shows the application speed of a notebooks relational to all of its components. 4.000 points is typical for a Core i3 system without a graphic card. The Fujitsu Lifebook AH550 achieved just 3.700 points. 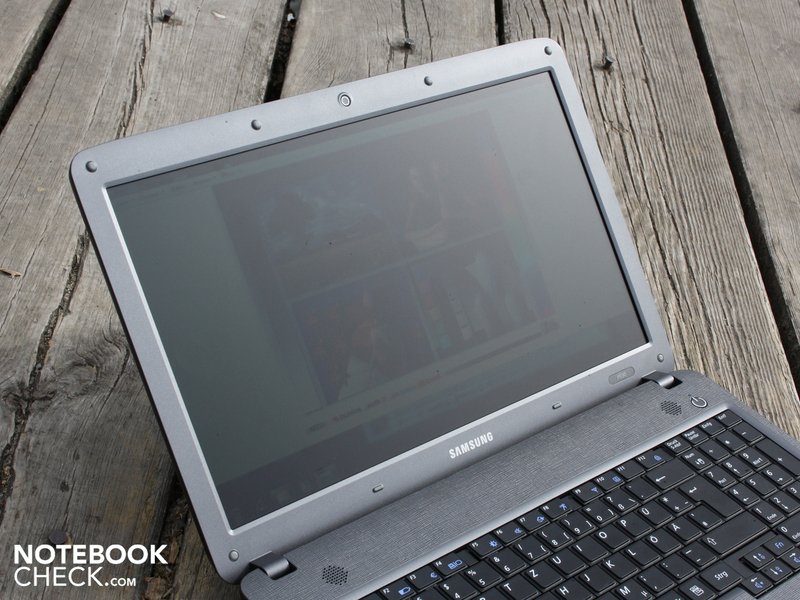 Laptops with a dedicated GPU have slightly better system performance. 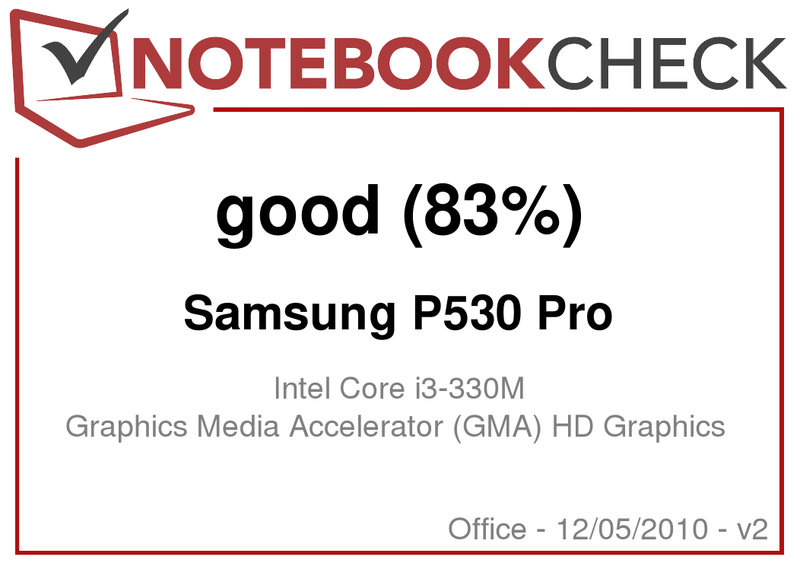 For instance, an Acer Aspire 8942G-334G64Mn (ATI HD5650, i3-330M), which comes out with 4.755 points. Or a Sony Vaio VPCEA1S1E/W (ATI HD 5145, i3-330M), , which emerges from the test with 5.156 points. The differences in performance when compared to a system without a graphic card can be seen when looking at the Core i5 processor 520M so often built in to high-performance systems. The Dell Studio 1558 gets 5.929 points. The reason for the difference is the Turbo Boost of the i5/i7 processors (i5-520M up to 2.93 GHz) as well as the generally higher clocking speed (2.53 instead of 2.13). The performance of the system is fully capable of handling household duties. We have here a working system free of lag, which only balks when multiple installations run simultaneously. Onboard the P530 Pro Pitts is a 320 GB harddrive from Hitachi (Travelstar HTS545032B9A300). The 5.400 rpm harddrive is very quiet. It is only audible by a quiet rustling and the clicking of the playback heads. The 320 GB are read with 58.6 MB/s in Sequential Read. 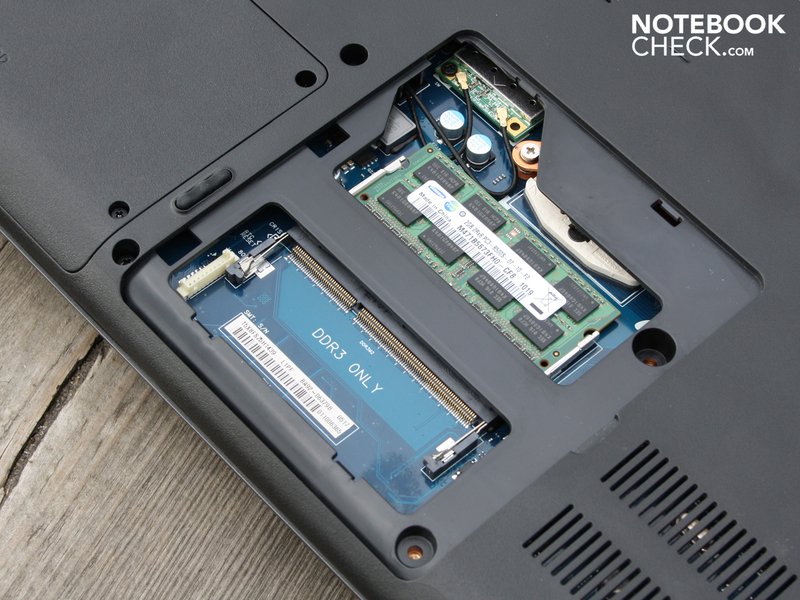 A below-average value which many 2.5" notebook HDDs can top. According to Hitachi the energy consumption is 0.2 watts in standby and 1.3 watts in hibernation. 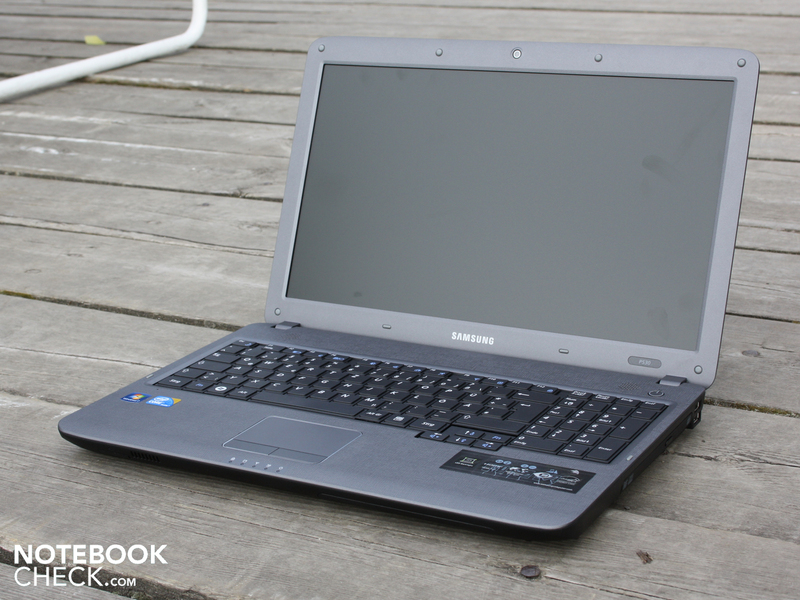 The manufacturer has been able to bring forth many ergonomically sound notebooks in the past. The R580, R780, P580, and N150 test samples showed already just how quiet and cool they could be. The only exception was the AMD equipped R525 Eikee (ATI HD5470) which had relatively high temperatures. 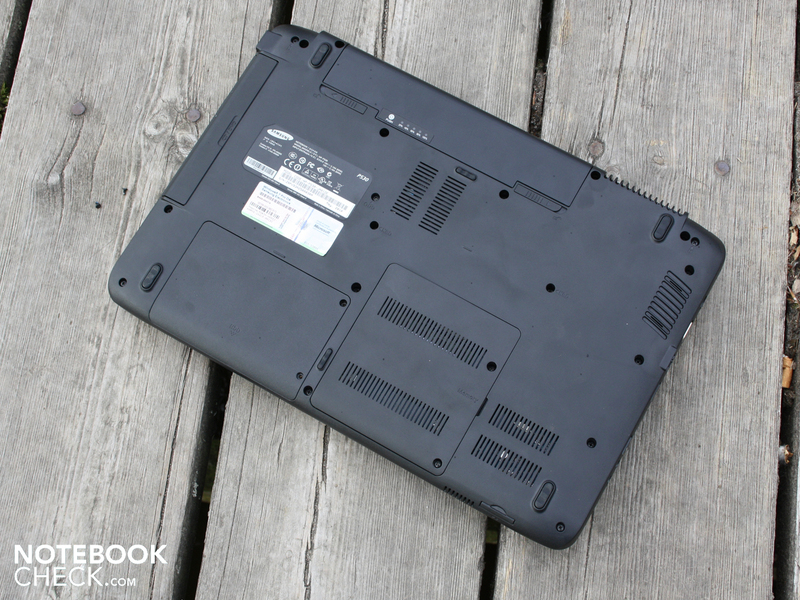 This is worth mentioning as the chassis of the P530 Pro before us is a modified R325 consumer case. There were changes in the cooling system, the air vents have moved from the side to out back. 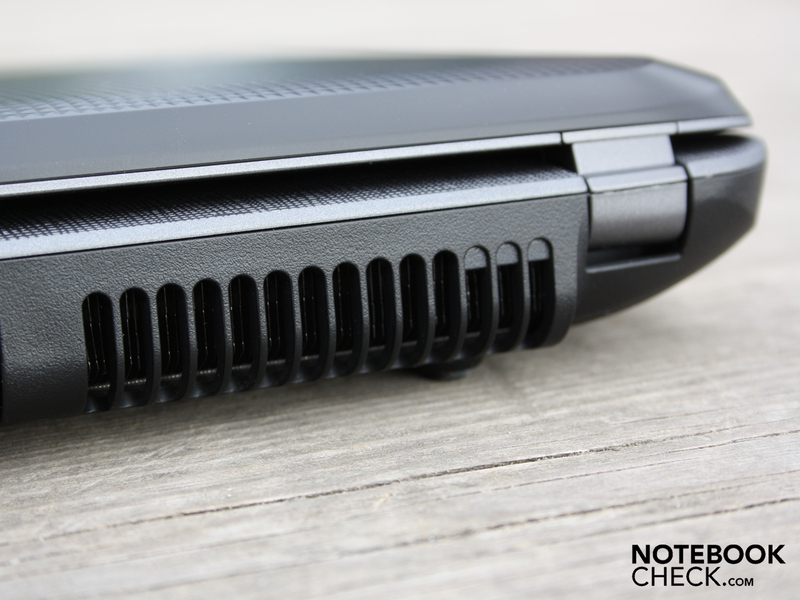 There area on the R525 Eikee where air streamed into the case is occupied on the P520 Pro only be a non-stamped-out hint of where a duct once was. The Samsung Silent Mode (Fn+F8) is again on board and proves itself once again. During simple office work like Word, Excel, Mail or Web browsing, the fan stays for the most part off, even during short loading phases of the processor. Only after the CPU has been used for an extended period does the cooler go into action, even in Silent Mode. The 320 GB harddrive is also not noticeable. It is very quiet (31.2 dB(A)) and only a tad louder than the minimum level at idle. That sounds perfect, right? Yes, but the quietness in the Silent Mode has as a tradeoff limited performance. The clocking rate of the Core i3 processor is limited to 990 MHz. 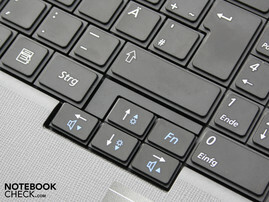 The is of course enough for surfing or typing in Word and it is also advantageous for energy use. The undemanding operation is pretty quiet, but how does it look under heavy load in a stresstest? The fan spins now at maximum capacity, but the volume level doesn't rise to above 34.6 dB(A). We carried out the test in the Samsung Speed Mode. Switching from normal to Speed Mode had no impact on the performance and the rotational speed of the fan. 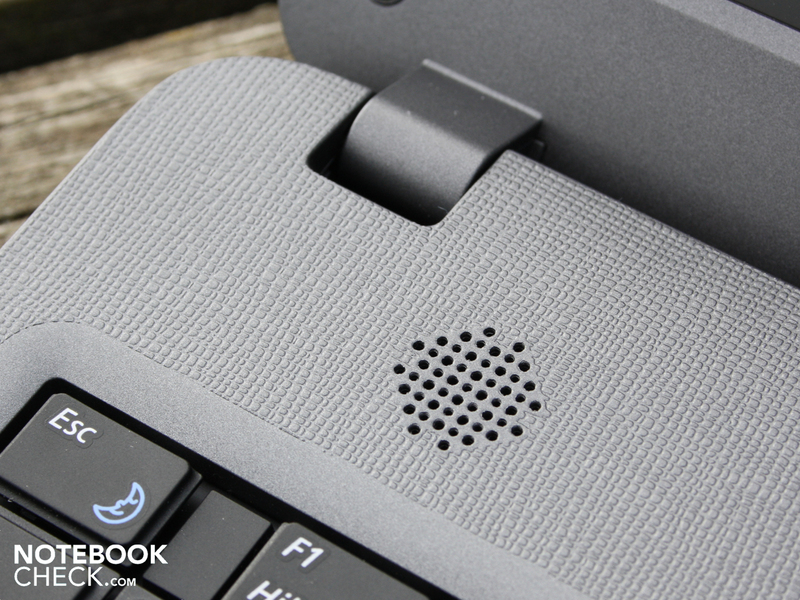 When surfing the Internet and writing E-Mails, the case remains cool to warm to the touch (Silent Mode). Not even near the air outlet does the temperature rise above 29 degrees. At 24 to 29 degrees, the upper side is at most lukewarm. Much to our surprise, hardly anything changes during periods of maximum load. After a two-hour stresstest (Furmark and Prime95), the upper side of the case was only 32 degrees warm (only at points). The palm rests did not get above 30 degrees. The base plate can also be held in ones lap. We also measured 32 degrees here. The sensors of the system show a maximum temperature of the CPU of 67 degrees Celsius after two hours of stress. This internal warmth is harmless and shows how excellent the heat dissipation is. The quality of the stereo speakers is not likely to impress anyone other than the unassuming office jock. The sound is clear and undistorted but thin. The sound is enhanced a small bit with the SRS sound improvements. With this, the acoustic becomes somewhat more balanced and spacial. SRS should be left active as the sound otherwise gets thinner. The volume is reasonable for a 15.6 incher. At maximum level, the small loudspeakers remains undistorted. With the acceptable luminance, the good imput devices and the hard-wearing surface, you might think the P350 would be well suited for travel. You'd think wrong, however, as the short battery life limits surfing and writing in the café or on the train. Those intending to use a UMTS surf stick for mobile Internet use have the cards stacked against them due to the high current consumption. The reason for the limited runtimes is above all the weak capacity of the battery at only 4.000 mAh (44 Wh). 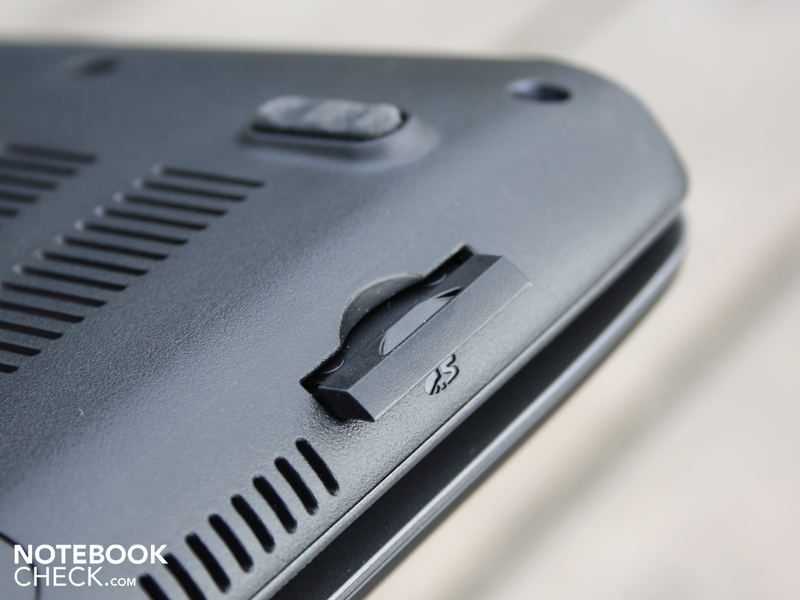 The manufacturer knocks its P539 down a notch here, as a P580 Pro has a stronger 5.200 Mah battery (57 Wh). Just two hours are possible when surfing the Internet (WLAN test). The maximum runtime of the P530 Pro at idle is around 296 minutes. Though these 4:56 hours sound terrific, they are unrealistic. WLAN deactivated, brightness on the lowest level and the processor out of engagement: No one uses its office notebook like that. In that respect, the manufacturer's information claiming "up to 4.0 hours" is theoretically possible but hardly feasible in practice. 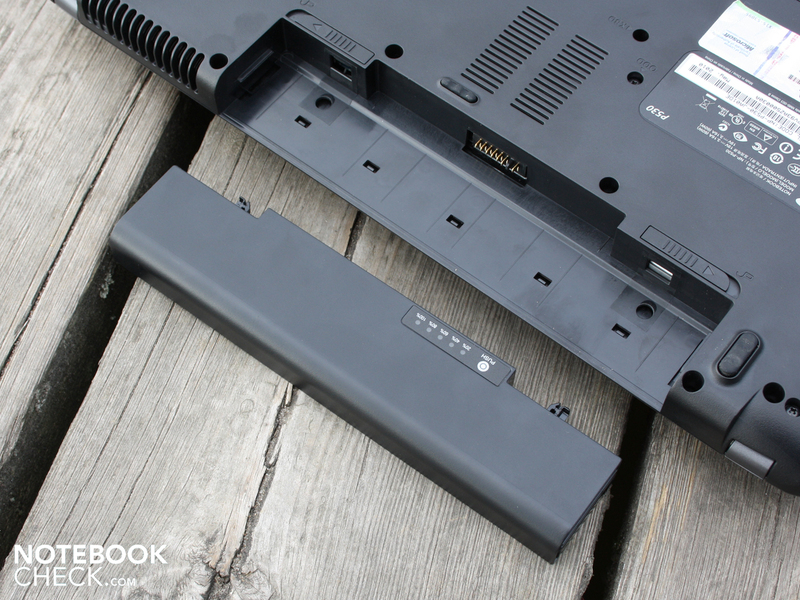 Before the user turns on his P530 Pro, he can check the battery's charge via the LED battery life prompt. He knows then if it is even worth it to turn it on. The P530 Pro is quite frugal with energy, especially at idle when it has little to nothing to do. When all saving options are turned on (incl. Silent Mode) and the luminance is dimmed to the lowest level, then the current consumption at idle is around 10.8 watts. Realistically one can expect an average of 13.8 watts at idle (profile balanced, Normal Mode). But the P530 Pro is no positive front-runner in terms of energy use. A Lenovo Thinkpad L412 0530-5ZG (i3-330M, IGP) gets along with 8.7 watts. 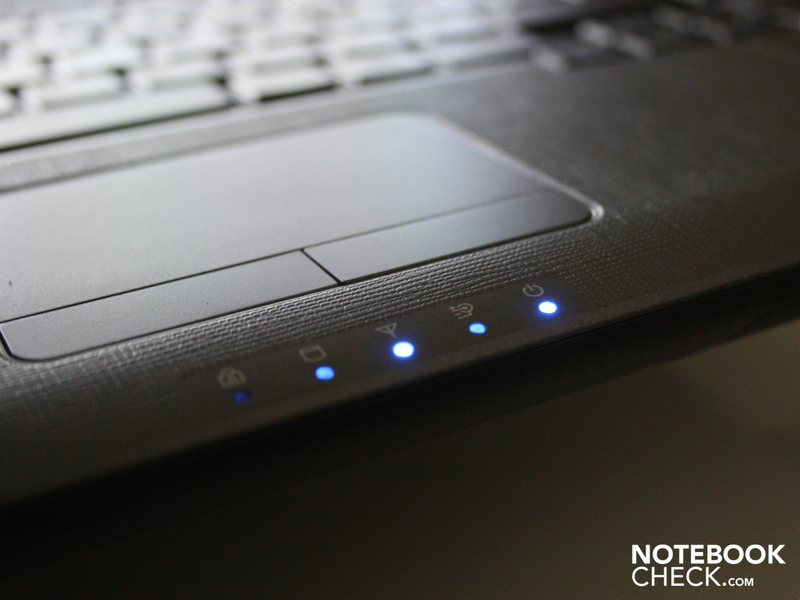 Despite its dedicated graphics, the Acer Aspire 3820TG-334G50N (i3-330M, HD 5470) needs only 8.2 watts (max. idle). We get the maximum current consumption in the stresstest with Prime95 and Furmark. The battery was taken out for the test. The multimeter showed 47.7 watts. The small 60 watt power pack (246 grams) is thus appropriately sized. 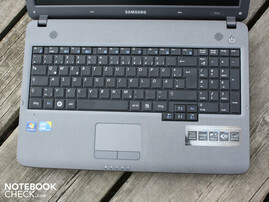 In its base configuration, Samsung offers a grippy and hard-wearing 15.6 incher with the P530 Pro Pitts. 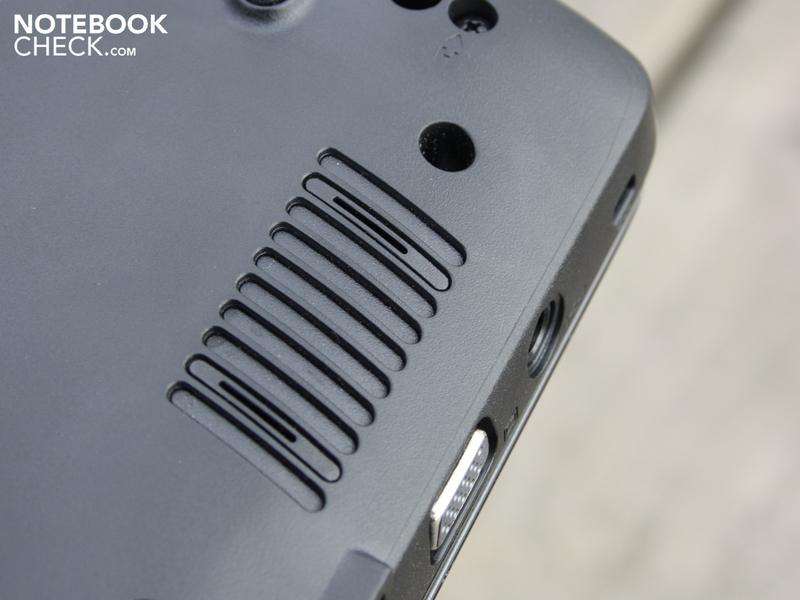 The simple plastic case impresses with its pleasantly grained surfaces. It could not do away entirely with he cheap plastic feel, however. The matt working area, the good layout of the keys, the minimal heating and the whisper quite operation attest to its place as an office machine. Though the Core i3 processor assures for descent performance, it is far from the i5/i7 performance class (no Turbo Boost). In terms of its drawbacks, one could mention the limited battery life and the spartan connections. Without dedicated graphics, the machine is frugal with energy (11 -19 watts at idle), but the low 4.000 mAh capacity of the battery doesn't allow for more than two hours (WLAN test). Those who only write can potentially squeeze five hours out of it, but who really does that in the lowest brightness settings? 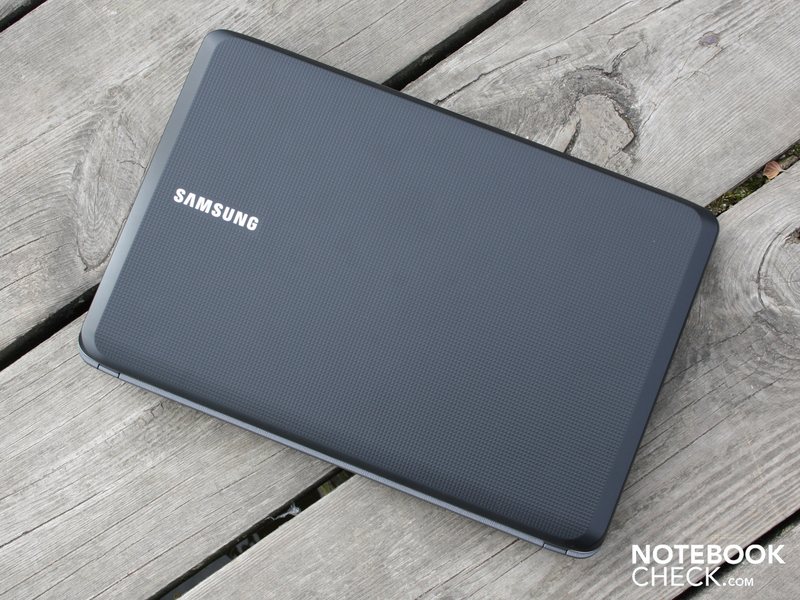 The 15.6 incher goes by the name Pitts and belongs to Samsung's lower-priced busieness series. 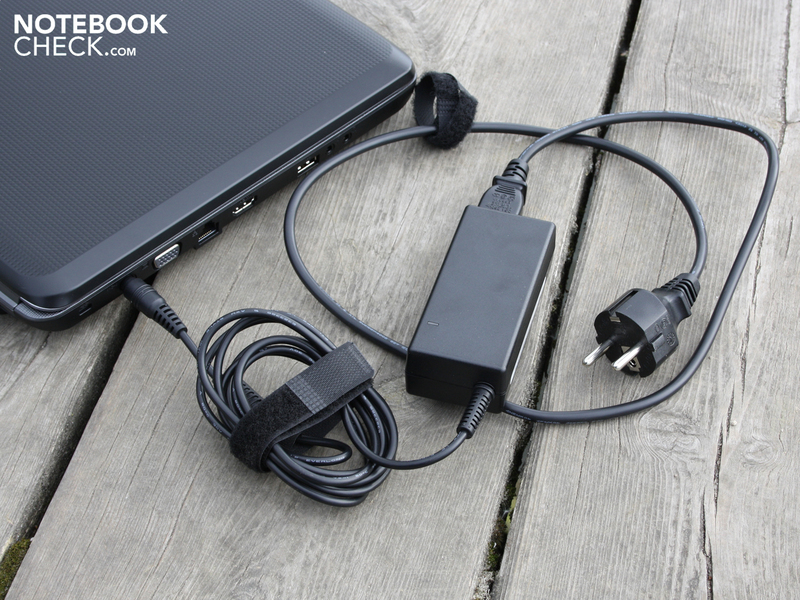 The power pack delivers up to 60 watts, enough for the low current consumption of 10 to 20 watts (idle). 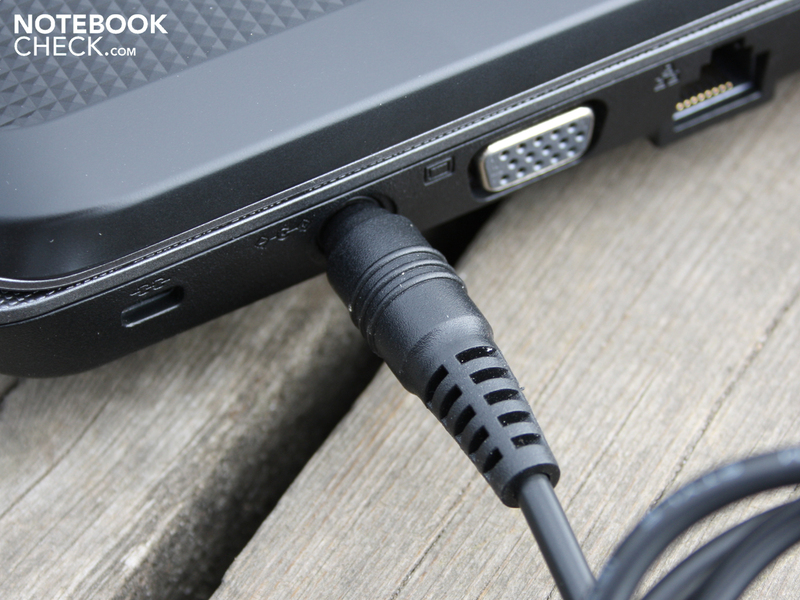 Which acts as an air outlet on the Consumer model R525. 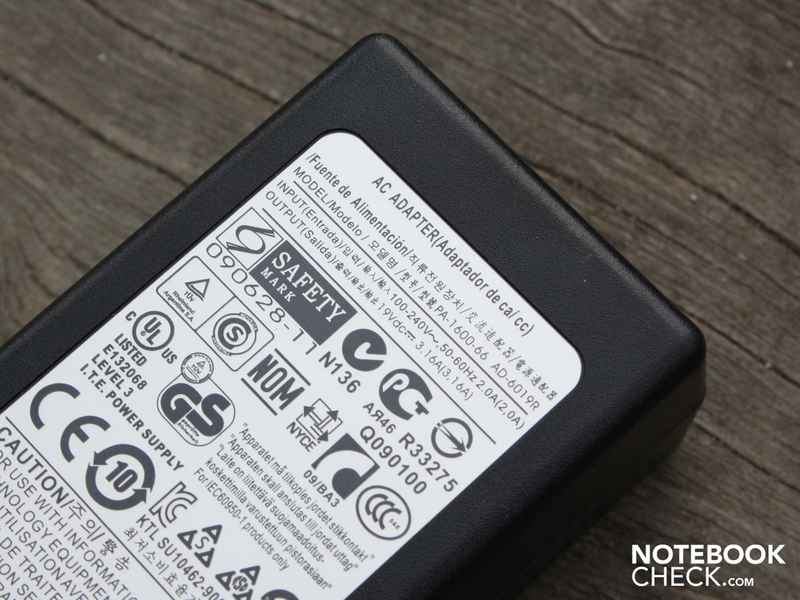 The battery has only a small capacity of 4000 mAh (44Wh). Two hours of surfing - and then one must check the power level. The limited runtime is a shame as the matt display is ready for the outdoors. Service openings on the underside expose two RAM shafts. It is a DDR3 bar with 2.048 MB built in. 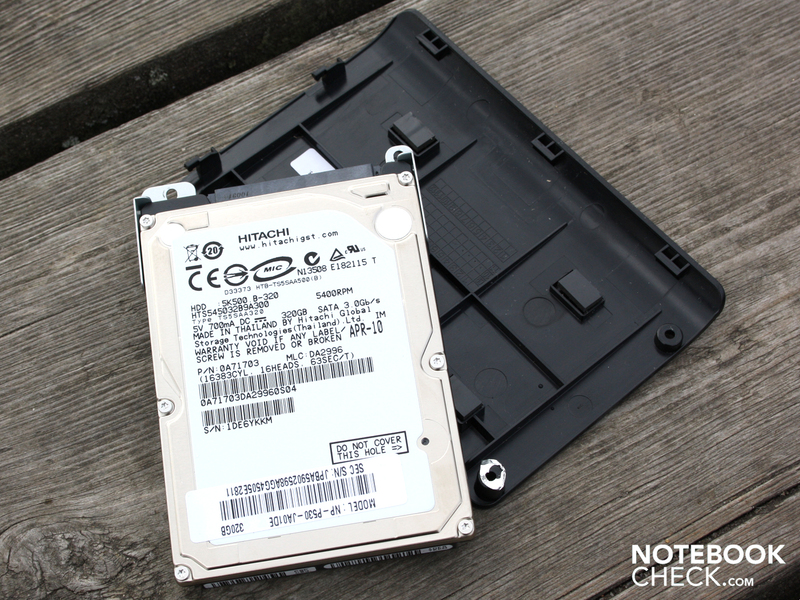 The 320GB Hitachi harddrive can also be swapped out. It is found in a rubber casing and is therefore almost inaudible. The small, 246 g power pack is good for transport. The base unit is also found amoung the Consumers: R525 Eikee is its name there. The optics of the Eikee were made more grippy, austere and less-reflective for the office. The otherwise good input devices remained the same. The plastic lid is finished in a grippy, hard-wearing muster. Thanks to the leather look, the working area is also neutral to fingerprints and remains slip-free. Everything is austere, there are hardly any visual highlights (VGA webcam). The status LEDs on the front side are the only blinking elements. The connections are bland fare for the office. HDMI is still on board. The right side houses only two USB ports and the DVD driver. 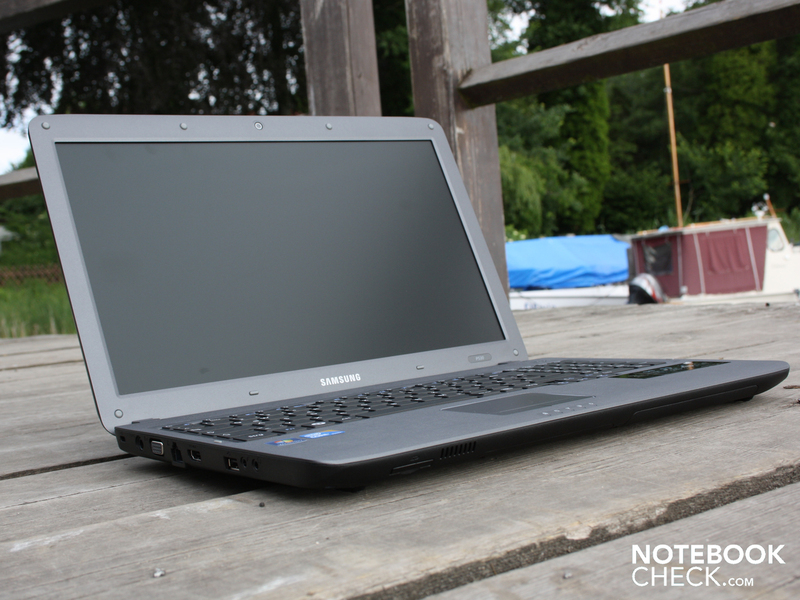 Samsung P530 Pro Pitts: Modest but handy working companion. Feng-Shui. More fun at work by doing away with unnecessary parts and connections. A battery with more capacity would have worked well with the matt, and well-lit display. The return of matt, visually and sensually appealing surfaces shows a high level of daring by the manufacturer. Simple office notebooks without all the bells and whistels: Acer Extensa e.g. 5230E, there are unfortunately no Core i processors on the Extensas. 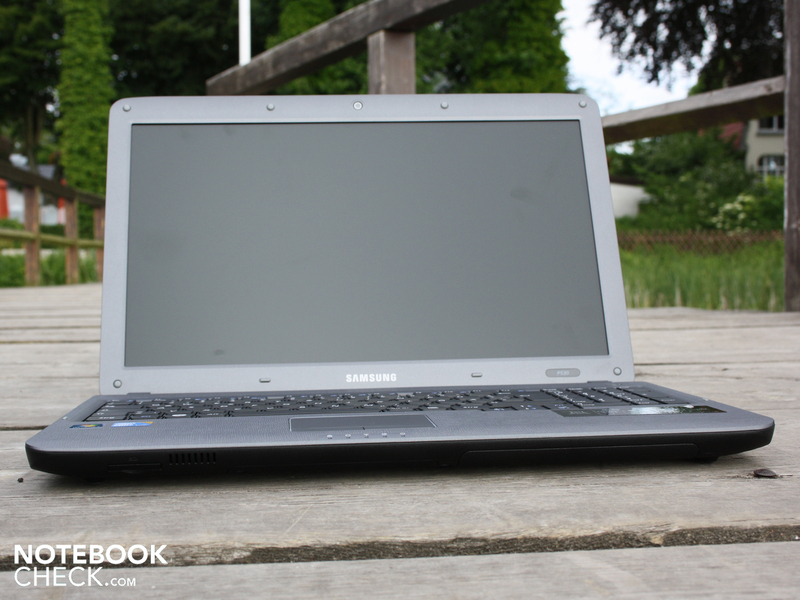 Samsung P580 Pro with Core 430M and IGP GPU. With dedicated graphics: Sony Vaio VPC-S11M1E or Asus U30JC-A1/QX043V (Optimus). 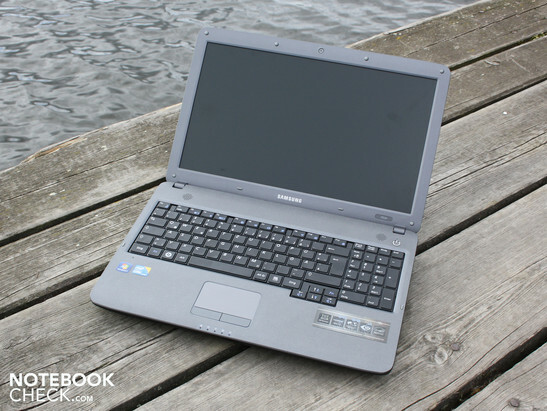 For extreme thrift: Lenovo G550 in variations starting at 350 Euro.